So I've had a li'l vacation from the fun over on CASE study: I've missed joining in the fun with those fabulous ladies on the CASE study DT and it was CASE study that motivated me to rescue what supplies I could get my inky mitts on and get busy! You can check out the original post with this super card here! So what did I CASE? Well with limited supplies I was totally hooked on the colour combo and grid pattern DP. However, as my DP is imprisoned somewhere I stamped it instead! Why a bike? Well, why not? It was love at first sight when I spotted this beauty of a stamp at the Hobbycrafts show a couple of weeks ago. Gotta 'fess up that it's one of a few stamps I have on hand to use at the moment! I even had to resort to using a clear CD case instead of an acrylic block - ha! Apologies for the poor pics: I'm yet to find a decent spot to take pics of my creations! So if I can create a CASE from such limited supplies, I'm pretty sure you lot could whip up something totally fabulous for the challenge! 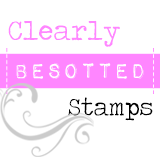 This week's sponsor is The Stamping Boutique so c'mon and join the fun! Good luck blitzin' them soon, and for now, let me just say that no limit of supplies is scaring your mojo off! Fabulous card! Hope you get sorted with the boxes soon. Welcome back Aimes...we've MISSED you! Awesome card...and I'm impressed with your creativity with the corner rounding!! Hope you're getting settled in your new home! Welcome back! Glad you have resurfaced but you have shamed me. 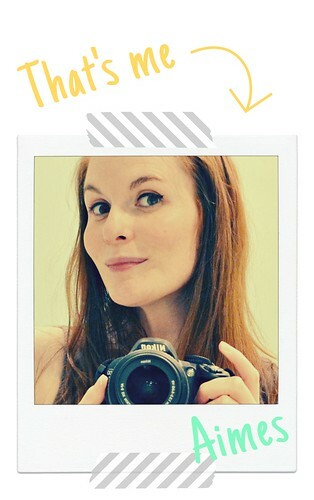 If you can make such an awesome card with such limited supplies than I clearly am just a lazy git! LOL! Must get off behind, stop making excuses and get crafty! Thanks for the inspiration and have fun setting up your crafty goodies this weekend. Love this Amy..so clean and simple - just my style! Hey girlie...aren't you so very clever and creative!!!! Even with limited supplies you are brilliant! What a fun, fabulous CASE!!! Love it! I had to pop to your blog from CASE Study to see your explanation of what you were CASEing lol! But I totally get it, and totally LOVE it! Your corner chomper must be lonely...and now fearing as a coin takes its place! Love your creation! Totally love this Aimes! Just plain happy!! 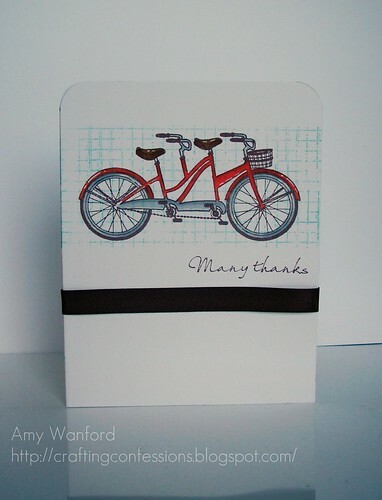 Okay, love your bicycle cards.. might have to case this one too!!! Very cute. Love the bike image. Hope you get all your supplies back soon! I love a bike, Aimes! Reminds my just as much of a pending Spring as butterflies do! Who rides their bike around in the snow? Great job on the CASE, love your wide open white spaces and simple, yet gorgeous, sentiment. Glad to have you back, my friend, Rock on! Happy to see you stamping again! Moving came be such a hassle. It's such fun finding things in boxes, that it's almost like new treasures. Love your bike stamp!